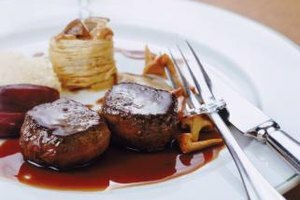 Beef tenderloin is especially tender when slow roasted, such as in stoneware. Roasting a beef tenderloin in the oven is a way to bring out a lot of flavor using high heat, which causes the internal fat in the meat to melt and make the meat its most tender. 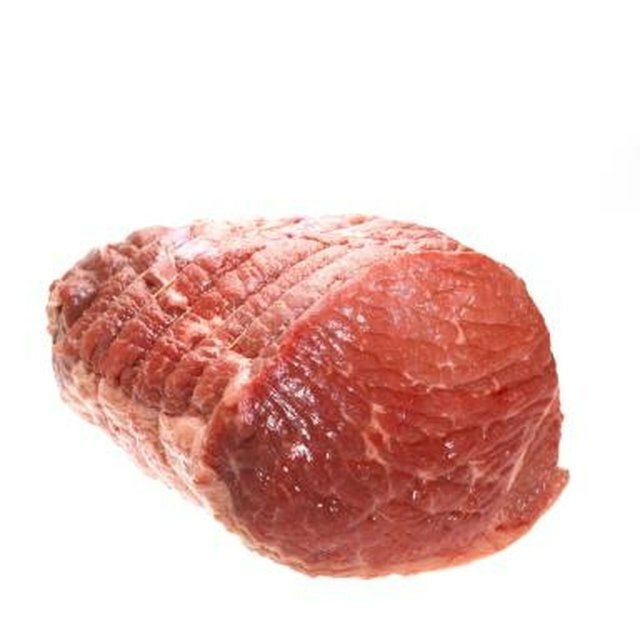 However, when roasting a beef tenderloin in the oven, it is often placed in a glass baking dish or metal roasting pan. The problem with this is many ovens, unless properly calibrated, have spots that are hotter than others inside, which can lead to uneven cooking unless constant attention in paid. Stoneware cooking pans, however, ensures even heating and browning throughout the cooking process. Remove the beef tenderloin from the refrigerator and from its packaging. Rinse the beef tenderloin under cool running water to remove any excess blood. Pat the tenderloin completely dry using paper towels. Let the meat sit at room temperature for 30 minutes to ensure even cooking. Cut away any excess fat and silverskin using a sharp knife and a cutting board. Cut the silverskin by cutting slightly into the meat and then cutting parallel between the meat and silverskin. Pull the silverskin away from the tenderloin as you cut. Cut the tenderloin vertically into two equal pieces. Cut several pieces of butcher's twine to wrap around the beef tenderloin pieces in order to ensure even cooking for both pieces of meat. Tie the pieces of twine so that they are about an inch apart. You can also tie the longer end of the tenderloin as well, but this is optional. Trim any excess twine with scissors. Add seasonings to a medium bowl and mix well with a whisk; seasoning that work well with beef tenderloin include dry mustard, horseradish, minced garlic or garlic powder, onion powder, salt, ground black pepper, oregano and cayenne pepper. Place the beef tenderloin sections in the bowl and coat them well on all sides. Preheat the oven to 400 degrees Fahrenheit. Add a tablespoon or two to the stoneware dish. Place the stoneware on the stone on medium high heat. Add the beef tenderloin pieces and sear for three to four minutes per side. Use tongs to hold the meat and sear each end of the pieces, too. Drain the oil and add the beef tenderloin back to the stoneware. Place the stoneware into the oven. Turn the meat periodically, say every 20 minutes, and roast until an internal temperature of at least 125 F, for rare, is achieved. Use an instant-read thermometer to determine the meat's internal temperature. Cook longer if you would like the beef to be more done. Remove the stoneware from the oven and remove the meat from the stoneware. Allow it to rest for 5 to 10 minutes to allow for carryover cooking and to allow the internal juices to redistribute evenly. Add a small amount of flour and a pat of butter to the stoneware and mix well with a whisk to create a pan sauce. Add a small amount of beef broth, if needed.